One of my oldest and dearest friends recently threw a party. I was so in love with all of the special touches I begged her to share the details with you! 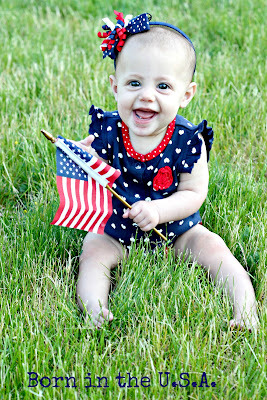 I knew this was the perfect time since the Fourth of July is around the corner, and her party had a similar theme. I am pleased to introduce to you my wonderful friend, Marie. She and I have known each other since middle school and even were cheerleaders together all throughout high school. 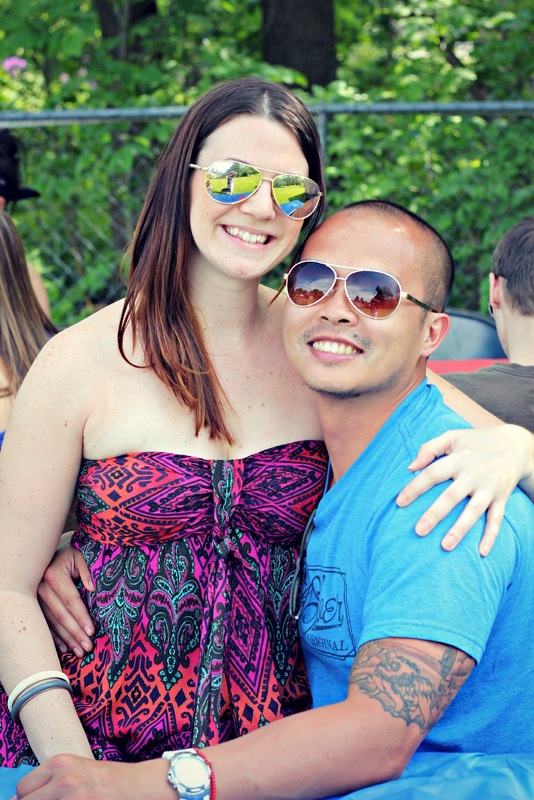 She met her husband years ago - and discovered he was Canadian. If you live here in Michigan, or anywhere along the American/Canadian border - you'll know the playful rivalry between the two countries. It's been really fun watching their relationship grow into a marriage and then parenthood across the border. Eventually he made the move to the mitten state, so of course he deserved a party. I'll let Marie tell you the rest. During my entire pregnancy & second year of marriage, my husband & I lived apart while waiting for his immigration application to be approved. Canadian/American relationships are NO JOKE! The process took 14 months of phone dates, weekend visits, lots of driving, & patience. I can say our relationship is stronger than ever. As crummy as it was, I am thankful my husband was just across the border instead of overseas like some marriages face. In celebration of finally living together, I decided to throw him a ‘Welcome to America!’ party. It was a potluck. 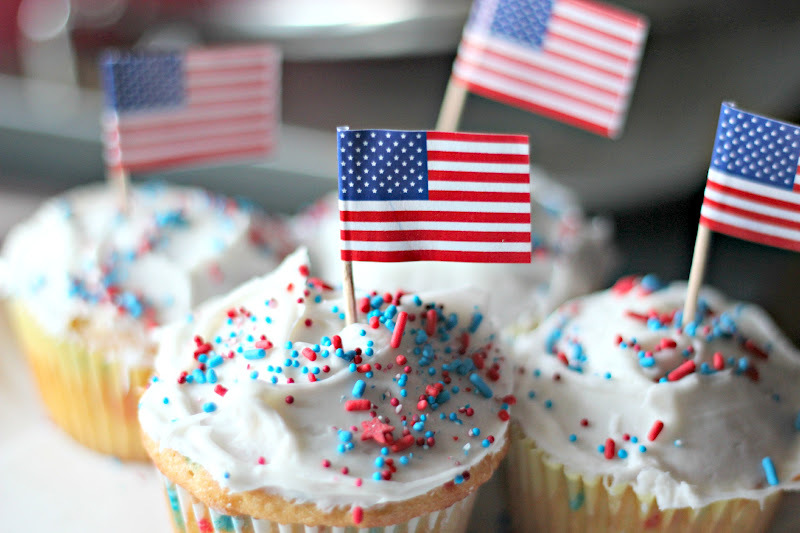 We provided hot dogs, burgers, BBQ pulled chicken, Extraordinary Cheese Dip from a Canadian company called Epicure’s recipe… DELICIOUS… found here: Epicure Selections, & of course I made patriotic cupcakes (from a box, nothing fancy). I topped them with flag toothpicks from Jo Ann’s - only a dollar a bag! 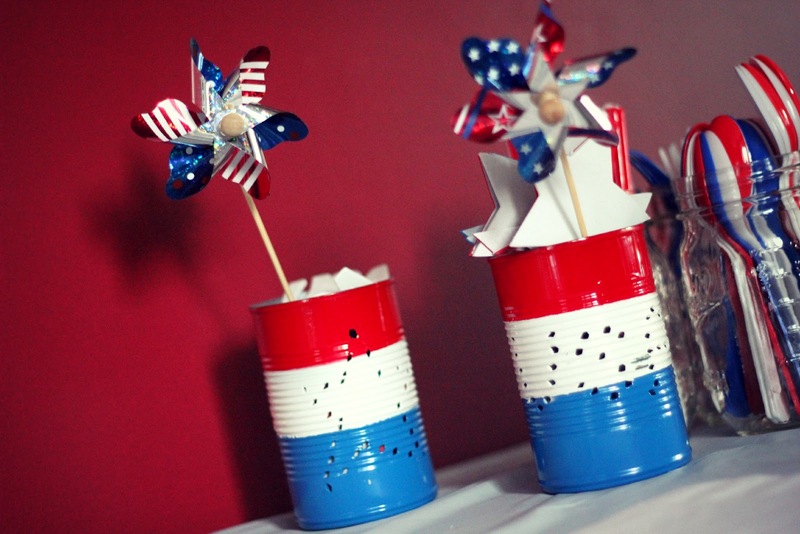 I used red, white, & blue table cloths, plastic ware, & paper plates. I hung metallic, cardboard stars in the trees & from our ceiling fan. I spray painted a couple of stars in the yard. I made a paper chain with scrapbook paper, too. I used Elmer’s glue, as I don’t have a hot glue gun. My husband & I made these cans together. I painted, he hammered the holes. I don’t use hammers/nails; that’s his job. They are simple: clean the cans, fill with water, & completely freeze (prevents denting). Mark your design (I made a star & the letters U.S.A. I imagine you can do something for any holiday). Then, take a hammer & nail & go nuts. Use masking and spray paint to get the look you want. I think the idea is a votive holder, but our party was during the day. The Pinwheels I found at Jo Ann’s also. 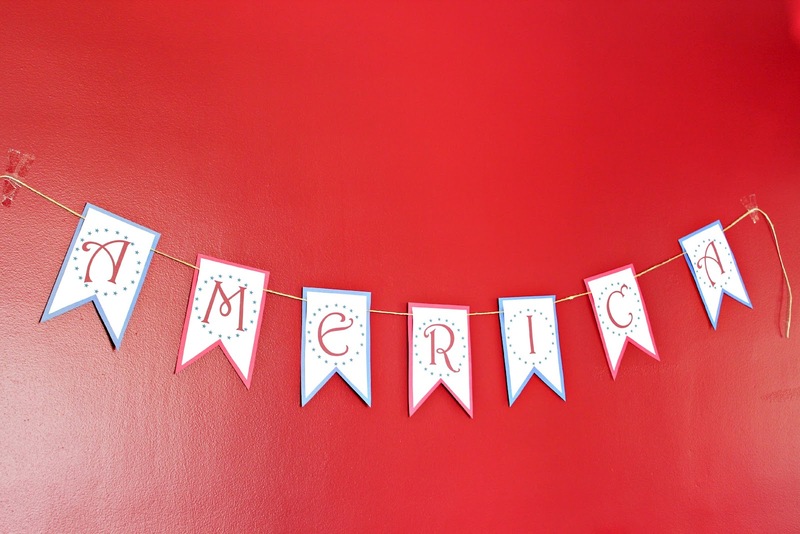 I made this ‘America’ banner from a template & glued the printed letters on white card stock to Red/Blue Construction paper since I didn’t have any colored card stock. Template found here: At Second Street. 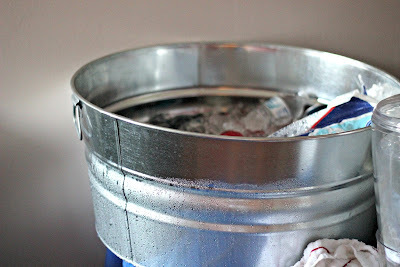 I had a beverage station in the dining room using a big metal utility tub filled with ice for the pop/water. This photo was after the party, so it isn’t as cute as when it was first set up. DO NOT DO THIS INSIDE!!! I’m not sure if there was a leak or just the condensation, but it dripped under the table, & made a puddle on the laminate floor. The floor is now warped & needs to be torn up to fix. Oops. However, it is a really cute idea for outside! The best part of the beverage table is the Carnival Lemonade Shake-Ups! These were a hit! 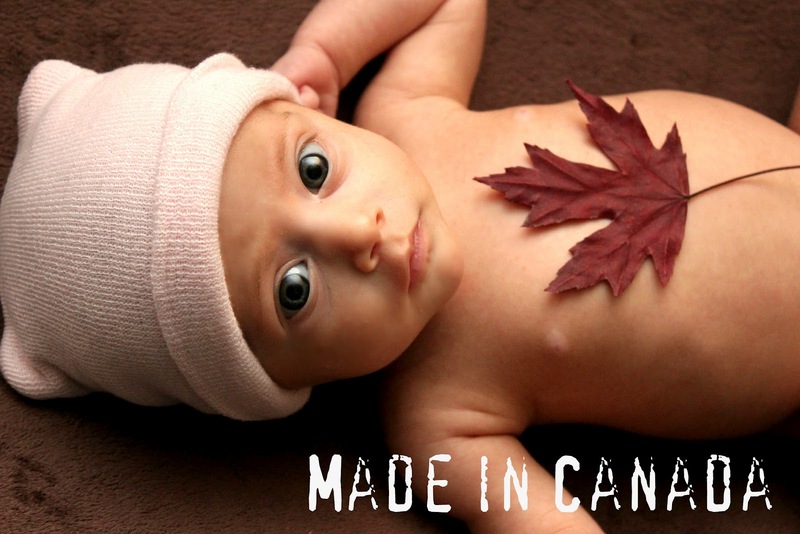 I lined up the driveway with different sized American flags and one wee little Canadian flag to his homeland. I wanted bunches of flags in vases, but when I went back to Jo Ann’s, they were sold out. I’m doing a 365 day photo project of our girl, so I dressed her for the part. 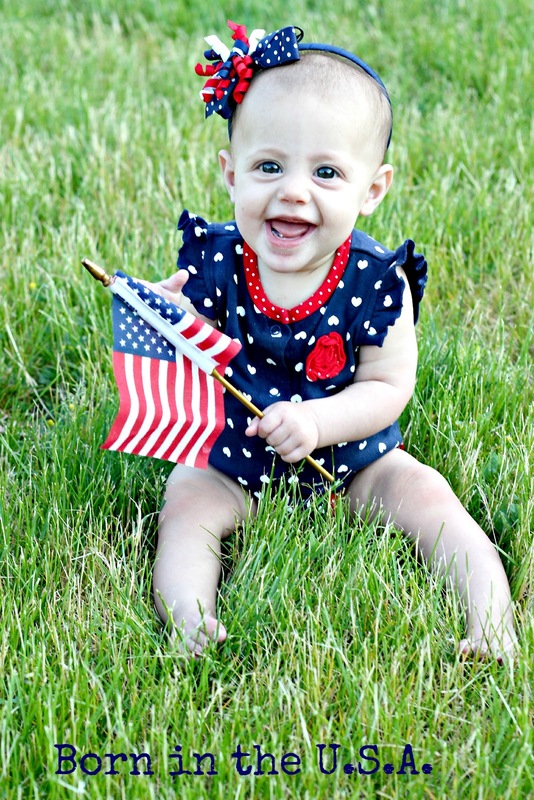 I had to take a picture not just because she was so darn cute, but because I needed to even out her patriotism…. The best part of it all was that we had a bunch of friends over to OUR place. You can see more of Marie's photos at her website: Marie Masse Photography and also at her blog that chronicles her project of taking 365 photo's of her daughter. One picture for every day of her first year: Kendall's World. GB and I had a great time at this party! I was loving the theme and good friends. 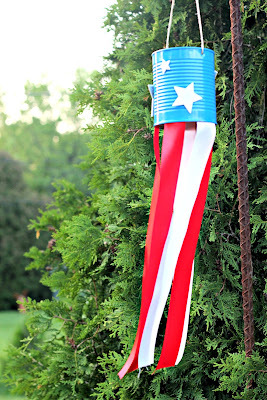 I'm hoping I can use some of her ideas at a Fourth of July party one day!